Washington State Park in DeSoto, Missouri, is absolutely amazing. Today the park features a park store, water craft rentals (canoes, rafts, tubes, and kayaks), gravel river banks to river swim from, rental cabins, campgrounds, swimming pool, playgrounds, trails and so much more; it is hard to imagine that it was once home to a group of Mississippian Indians over 600 years ago. 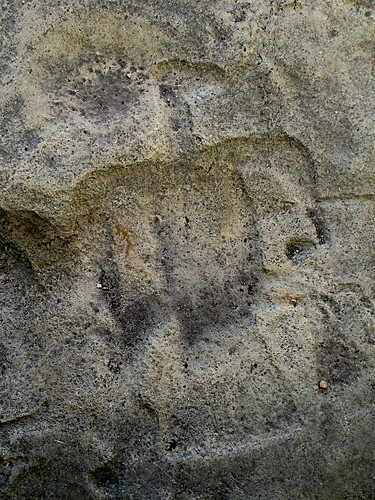 It was these Native Americans that literally left their mark on the area in the form of fantastic petroglyphs, which are (for the most part) still undecipherable even today and the petroglyphs here make up 2/3 of the known Missouri carvings! 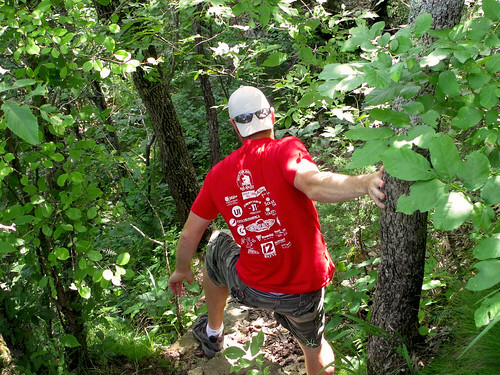 For the outdoor trekkers you'll find the park is home to three trails: the 1.5 mile 1000 Steps Trail, the 2.5 mile Opossum Trail and the 6 mile Rockywood Trail (backpackers will find a camp on this trail). Although the family and I wanted to "hit em all", for our visit, we concentrated on taking time exploring the petroglyphs, park amenities and then took foot to the 1000 Step Trail. the lot from the Thunderbird Lodge. To reach the 1000 Step Trail follow the signs to the Thunderbird Lodge, which is an outstanding example of the African American Civil Conservation Corps handiwork, and park in the lot there. Now, I absolutely must give out a bit history here, because this trail is so unique and beautiful that credit simply has to be given to the Civil Conservation Corps (CCC). The African American Civil Conservation Corps Company 1743 began developing the park land soon after the land was aquired in 1936. Without their skill and stone-masonry most of the buildings (including the Thunderbird Lodge where the company's main camp was located) would not exist and the 1000 Steps Trail would not have a single hand carved step to its name. You will pass by many examples of their work throughout the park, but will find three awesome examples on this hike; Thunderbird Lodge, the steps themselves on the trail and a gorgeous overlook shelter that practically begs you to take a photo of the Big River and the lush valley that contains the float-tastic river. These buildings were placed on the National Register of Historic Places in 1985. Ok, now let's get to hiking! complimenting them rather than competing. After checking out the Thunderbird Lodge, and maybe booking a float trip for later, you will quickly find the trail head for the 1000 Step Trail just across the parking lotfrom the lodge. The hike begins quite easy, with a well maintained dirt path (watch out for tree roots) that skirts the road and provides a ground level view of the Big River out in the distance. You will soon reach the loop portion of the trail where we took the left path and followed the Yellow (1000 Step Trail) Blazes. The trees that quickly envelop you are large and seemingly ancient, providing much needed shade for a summer's hike and (I would imagine) would provide a beautiful palate of oranges, reds and yellows during the fall. As we progressed you will see small examples of the CCC's attention to detail, with rocks that line the trail fading in and out, and small bridges that cross spans that are easy to hop. As you continue on and the Big River begins to disappear and the hardwood and pine woods surround you, the first of many CCC placed steps will reveal themselves, yet seem dissolve into the very environment in which they are contained, a perfect example of man working in coordination with nature. 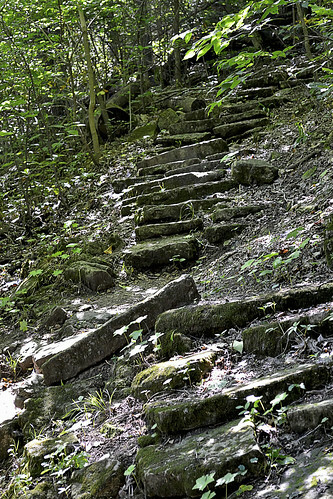 Now, while climbing these steps you will quickly notice the carpet of moss, lichens and plant-life, these may make the steps slippery so climb with a touch of caution. As you make your way on the trail (primarily uphill that is), you may find turkey, deer, mischievous squirrels and other small mammals, as well as small toads and frogs (always a family favorite! ), but keep a particular keen eye out during summer as the eastern collared lizard can be found skittering and leaping, upright on their hind legs, from rock to rock. The hardwood forest, consisting of towering Oak, Hickory, Kentucky coffee, sugar maple and slippery elm, has a good undergrowth of pawpaw trees, and if you're lucky you may even find a bit of fruit on one of those pawpaws (if the squirrels and deer haven't found them first). About halfway along the loop, the forest will begin to thin as you approach an opening near the nature center and the restrooms (both constructed by the CCC), during this bit of the hike you may find some wonderful wildflowers, including: Blue-Eyed Marys, Bluebells, Trilliums, Violets and Poppies a particularly lucky and keen eye may even find a rare Primrose, Fremont's Leather Flower and the ever so delicate Blue-Violet Nemastylis. 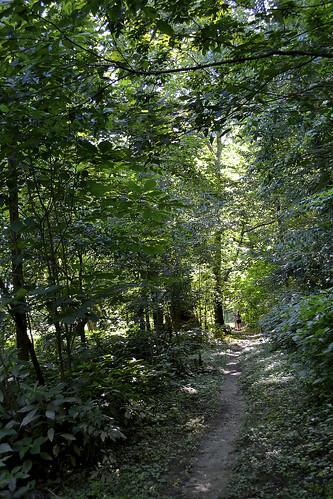 After searching for wildflowers and re-emerging into the forest, be sure to take the right fork to stay on the 1000 Steps Trail, unless you're looking for a place to picnic, then head left, as it takes you to a nice picnic shelter. As you continue on the trail you will soon come to one of the best scenic overlooks I've visited. The view allows for a panoramic glimpse of the Big River and the valley through which it runs and, when under clear blue skies that contrast the lush green of the valley, it's a hard view to beat. 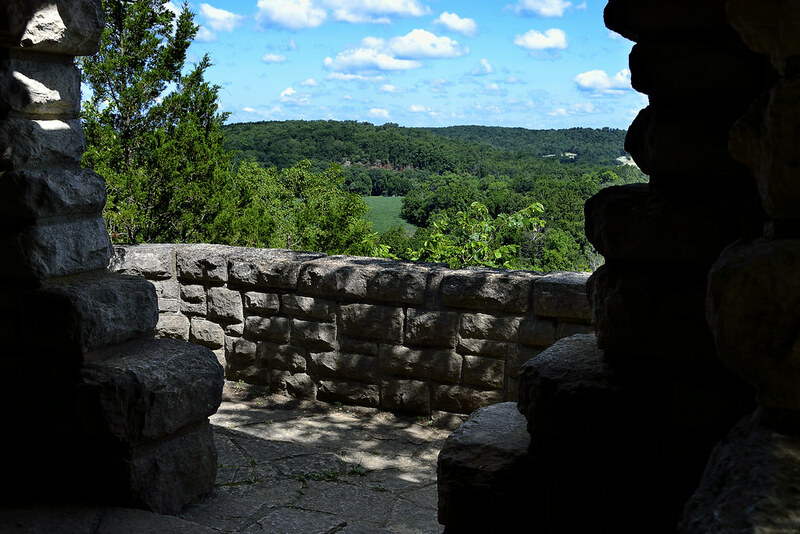 Better yet, you can enjoy the view from the quaint CCC constructed overlook building, which melds in perfectly with the surrounding bluffs upon which the site rests. At the overlook building you can also catch a refreshing breeze and closely examine the skill with which each block was cut, placed and set. You may even "off trail" as small trail runs near the overlook. After giving your soul a chance to absorb a bit of the Big River horizon, you can continue down the trail which will take you down a dolomite bluff, where rocks have separated from the face and some have tumbled onto the path. Watch your footing here as the rocks can easily slide out from underfoot and send you swiftly to the sitting position, perhaps bruising your pride and your tailbone. As you continue, be sure to look at the path itself, the small rocks imbedded and loose on the trail may be hiding a plethora of quartz crystals in their geode like folds and holes. Just before the end of the trail there is a perfect place to sit on the steps and simply take in the last bits of the serenity that surrounds you, breathe it in, take a few pictures and head back to the trail head. 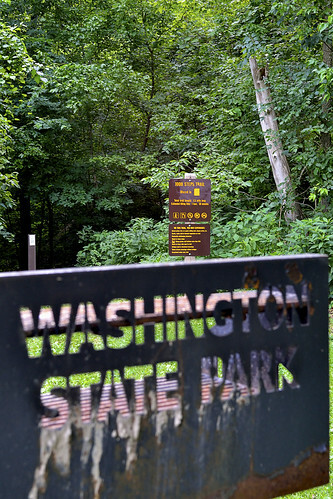 After hiking the 1000 Steps Trail, and really being introduced to all the outstanding things to do in the park, we can't wait to return to Washington State Park. Next up with most likely be a backpacking trip through Rockywood Trail to view the quarry used by the CCC for the local buildings and a search for the elusive Missouri tarantula! The overlook absolutely BEGS you to take photos here! As always, thank you for reading. If you're interested in meeting up for hikes, sharing your hiking experiences and find great locations to explore please visit us on Facebook and give us a like.